This year, the organisers decided to support the Great North Air Ambulance Service (GNAAS), a charity we think most people will have heard of through social media, local news reports or even having known someone who has been helped by the team in the incredible work they do. What might surprise some people is that the GNAAS doesn’t receive any Government funding and relies solely on public donations. We were really happy to be able to help with fundraising efforts at the Auto Show with our raffle, with thanks to those who took part it raised £200 for the charity. 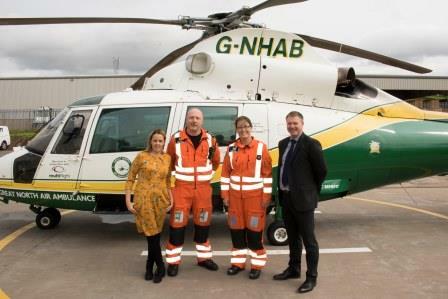 Following the show, Mike Deans, Managing Director of our Borderway Finance team and Becky Towns, our Community and Events Co-ordinator were fortunate enough to be invited down to the base in Langwathby to visit the team from Cumbria GNAAS to hand over the donation. During the visit, they got to have a sneak peak inside ‘The Pride of Cumbria’ and hear first hand from Terry and his team about the brilliant work the charity do. Mike and Becky both found the visit really insightful. From hearing how the helicopter is equipped with the latest flying technology, which means they can fly safely even in extremely poor visibility, to a bit of background on the crew and what it was that motivated them about joining the GNAAS. This in itself was amazing to hear, as for some of the team, they help the service on their day off from their normal day-day to job. It’s thanks to Terry and the team giving up a bit of their morning, that we had the opportunity to hear first hand what’s involved when they are called to life-threatening or potentially life threating incidents across the region. What has really stuck with Mike and Becky since the visit was seeing and hearing that no matter how challenging the situation, what gets the team through is their support of each other, and that amazing team spirit and camaraderie they each had. If you’d like to find out more or if you’d like to make a donation, you can visit the **GNAAS website**, which provides more detail on the incredible work they do.